I’m still in a movie watching slump and that’s why I’m really grateful to have another guest post from nem baj for you today. His post is dedicated to a movie I haven’t seen yet. In all honesty, I hadn’t even heard of it although I’m familiar with many of Jean Jacques Annaud’s movies. In a nutshell: two French and German outposts in 1914’s central Africa, cut away from their respective metropolitan authorities, mimic the European conflict once they have learned its existence – six months after the hostilities have been declared in Europe. 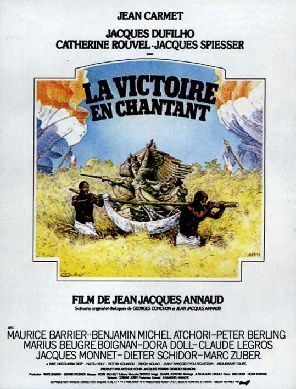 Focusing on the French, the movie is a satire of patriotism and the ‘civilizing mission’ of french colonialism. Director Jean-Jacques Annaud may be known to younger audiences as the craftsman behind international productions such as The Name of the Rose, Seven Years in Tibet or Enemy at the Gates, but he started his career in France by directing two little rebellious films, Hot Head (about local sports celebrity and politics) and Black and White in Color, which is a war movie based on an actual event. It is a comedy, cliché-based from the start, the Germans being organized and professionals, whereas the French spend more time speaking, eating and making love than preparing for a fight. Yet the latter are so vain they launch the first offensive, which ends up being a disaster. Now they’re scared and in a defensive mode – which means time has come for a radical change in leadership. For the main weakness of the French is the way the small community in their outpost envisions exploitation: the locals are not considered as men, crooked shopkeepers and even more crooked missionaries exploit the populations for immediate profit, and the only French soldier, a sergeant (seconded by a handful of tirailleurs, professional Black soldiers), is only a few months from retirement, and has never fought a battle except maybe against the appeal of booze and local women (those battles he seemingly always looses). However, a young educated geographer, a pacifist and a socialist, decides to take over after the defeat. He engages the village chief, using the antagonism between villagers and bush tribes, to capture fresh cannon fodder from the countryside. Then he appoints the local White bully as a staff trainer, and takes a Black woman, possibly of high rank, as his mistress. The result is a brand new force of African soldiers, which is used to launch a new offensive on ‘German’ soil, this time with better, though inconclusive, results. They start digging trenches similar to those appearing in French magazines… I won’t spoil the ending. The whole thing is a cruel satire, the story of a ridiculous war fought by Black proxies on account of racist White trash. Whether you’re a French with self-irony or a fan of French-bashing, it will surely please you. But its strength lies in the fact that is quite witty. The role played by language barriers is both symbolic and hilarious. Also, on one hand the Africans are real people, with their own identities, language and distinct approaches to the colonizers – yet on the other hand the recognition of their social existence by the French geographer gives him more exploitative power than his predecessors ever had… which in turn seems to give new strength to the contestation of colonial power. And finally, the intellectual betrays his own pacifist ideals for the pursuit of glory, sending more men into combat… in the name of humanism. I’m glad to have another guest post today. This time it is from one of my oldest blogging friends, Kevin aka The War Movie Buff. He started his war movie blog only a few months after I started mine and I was glad to find someone who doesn’t only share the interest and posts regularly and writes in a very detailed and passionate way but also someone who answers comments and likes a good discussion. In August, 2010, I went to see a movie called “Julie and Julia”. Little did I know that taking my wife to a chick flick to get brownie points would change my life. The plot of the Julie half of the movie involved a blogger cooking a different recipe a day and writing about it. That gave me the idea to start a blog where I would review the greatest war movies. I had recently encountered Military History magazine’s issue on the 100 Greatest War Movies so I used it as my guide. My plan was to review one movie per week starting with #100. I started as simple a blog as I could handle (being computer-challenged) and journeyed into uncharted territory not knowing what to expect. I truly did not expect to get much traffic and being a high school history teacher I am used to lack of recognition. However, my very first post resulted in a response from a blogger named “All About War Movies”. This person quickly became my mentor, colleague, and friend. In recognition of that, I have chosen to write this guest post on a movie I never would have seen without her influence. When I became a faithful follower of “All About War Movies”, I realized that there were some very good foreign war films that I should watch. Being an American, this was news to me. In my whole life of watching hundreds of films, I could recall having watched only one foreign film (“The Seven Samurai”). I quickly came to respect Caroline’s recommendations and anytime she mentioned a movie I had never heard of, I checked on it. I decided to expand my parameters to include categories beyond the 100 Greatest. One of those categories is what I decided to call “Should I Read It?” which refers to subtitled movies. The first foreign war film I blogged on was one of Caroline’s favorites – “Joyeux Noel”. I was hooked on foreign films instantly. I now even watch non-war, subtitled films. I am proudly less Americentric now. I give this background because the movie I am going to write about is not only a foreign film, but the best war film I have seen since I started my blog. It reinforced my belief that modern war films can and should be superior to old school war movies, even the classics. Technology and experience are huge advantages for modern war movie makers. 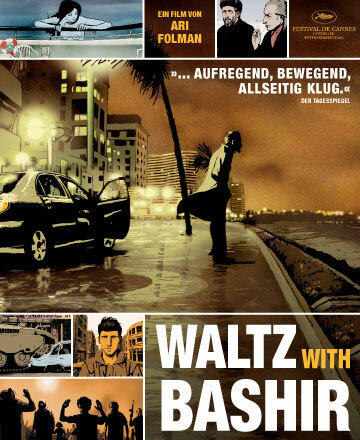 “Waltz With Bashir” is an Israeli film released in 2008. The movie blew me away because it hit several of my buttons. It is historically accurate, I learned about an event that I knew little about, it is realistic in its depiction of the military and combat, and it is striking in its cinematography. Writer and director Ari Folman spent four years creating what he calls an “animated documentary”. If not the first of this type, it is still ground-breaking. It won numerous awards and was critically acclaimed. The film is autobiographical. Folman takes as his theme the effects of war on memory. The movie begins with a jaw-dropping three-dimensionally animated scene of a pack of dogs running through the streets to a man’s apartment building. The dogs represent a memory flashback for a friend of Ari. The friend tells Ari each dog represented the 26 dogs he sniped during the Lebanon War of 1982. This conversation causes Ari to confront the fact that he has holes in his memory of his experiences in Lebanon. That very night he has his first flashback which involves himself and some naked comrades coming ashore on a beach at the city of Beirut. Another friend theorizes that people sometimes fill in gaps in their memory with fiction. He encourages Ari to try to fill in those gaps with the truth. Don’t fear opening those doors, “memory takes us where we want to go”. He assures Ari he cannot get hurt by learning the truth. Ari goes on a quest to talk to comrades he served with and other veterans of the invasion. Their individual stories are vignettes that powerfully depict the nature of modern war. Several universal truths about warfare and young soldiers shine through. The adrenalin-fueled fear in a firefight is followed by the overwhelming silence of death. Soldiers tend to fire their weapons at nothing and nowhere when traveling through enemy territory. Soldiers are clueless pawns of the brass and the pols. Surviving members of a unit suffer guilt feelings. Unlike some anti-war movies, “Waltz with Bashir” does not glamorize the appealing aspects of armed combat. The movie and Ari’s quest builds to the infamous Sabra and Shatila refugee camp massacre. Ari’s unit is sent into western Beirut after the assassination of the Christian Phalange leader Bashir Gemayal. The film takes its title from an incident in which a member of Ari’s unit waltzes with a machine gun in the middle of a Beirut street while under fire from snipers and RPGs and as Lebanese civilians spectate. Time seems to stand still as he twirls amidst the bullet casings and ricochets. The dance symbolizes Israel’s relationship with Bashir. The film concludes with the Israeli Defensive Forces allowing vengeance-minded Christian Phalange militia to enter the Muslim camps. The individual Israeli soldiers exhibit cognitive dissonance as they are slow to grasp what is clearly taking place before their eyes, abetted by their lighting the night skies with flares. It takes three days for an Israeli general to order a stop to the killings. The movie makes it clear that the Israeli government (Defense Minister Sharon and Prime Minister Begin) was complicit in the massacre, but Folman is not on a crusade. He lets the audience connect the dots. The memory theme comes full circle as Ari realizes that he had filled in the black hole of his memory of being near the atrocity by imagining that he and his comrades were instead at a beach. The movie closes with real footage of the massacre victims as though to remind the audience that although animated, the story is true. I love war movies because I love Military History. I have been attracted to war stories since I was a child because of the action, but also because war brings out all the emotions and character traits in human beings. I prefer war movies that have action and are true to human nature. They don’t have to be historically accurate, but I insist they not be ridiculous and unrealistic. When you have seen as many war films as I have, you also are impressed when the movie takes a different approach to telling a war story. “Waltz with Bashir” fits this description (as do “300” and “Oh! What a Lovely War”). Movies like these prove that although the war movie genre (starting with “Birth of a Nation”) is almost a century old, there are still new ways to tell a war story. “Waltz” looks very different from every other war film I have seen. Folman uses a variety of animation. The movie is mostly a blend of cut-out and classic animation. It is influenced by graphic novels and has a scene reminiscent of Japanese animation. He includes some three-dimensional scenes, but used the technique sparingly and only for spectacular shots. His use of color varies depending on the mood of the scene. The war scenes tend to be monochromatic. The home front scenes are much more vibrant. (He makes the point that although he was fighting only twenty minutes away, at home the public was unaffected by the war and life went on as usual.) The shading and shadows are amazing. The look is mesmerizing. Blu-ray was made for movies like this. The movie is true to human nature mainly because these are real people who Ari interviewed and built the story on. From my reading of men in combat, I have a good idea of how men behave under that stress. For those vast majority of people who do not want to read extensively in this difficult area, movies can serve the purpose of educating civilians about what their young warriors go through. This is important because these young men deserve to be understood. Civilians need second-hand memory. Undoubtedly, some Israelis were offended by what they saw in “Waltz”. The fact is that atrocities happen on both sides in every war. Good war movies like this show what really happens in war, but also provide the why. As an American, I admit to being ignorant about most modern non-American wars. My blog experience and Caroline’s influence have opened up my eyes to several conflicts that I would have remained clueless about. I have watched movies on the Bosnian War (“No Man’s Land”, “Pretty Village, Pretty Flame”), the First Chechan War (“Prisoner of the Mountain”), and the Lebanon War (“Beaufort”, “Lebanon”). They are all good movies that taught me something and encouraged me to research the war. My modus operandi when I read books is usually to read books that I can learn from. I am not as strict with movies, but it’s an added bonus when the movie is instructive. In conclusion, we war movie lovers all have our reasons for loving this genre. But don’t forget it is a genre with many fascinating subgenres. Be willing to sample from them all, even the ones where you have to read. And try out the newest one – animated war documentary. Thank you Caroline for giving me this opportunity to spout.